1. 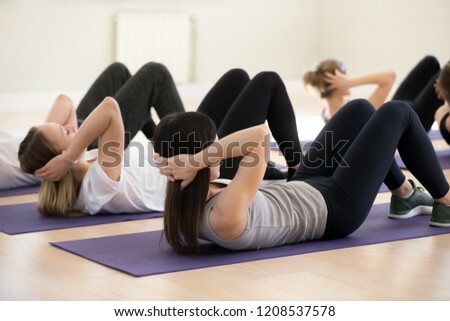 SIT-UPS :- For Sit Ups lie on back with knees bent and feet on floor,raise arms overhead and inhale.As you exhale,lift your trunk and reach for your feet with your hands.When the shoulder crosses over the hips,inhale and go to starting position. 2.SIDE PLANK :- To do Plank lie on your side with elbow directly under your shoulder,lift hips off the ground.Shoulder,knees,hips and ankles will be in a diagonal straight line.Neck aligned with spine.Maintain a Natural Breathing pattern throughout and maintain position till you can maintain proper form and alignment.Repeat on other side also. 3. PLANK :- Lie on floor belly down,raise your feet so you are on on your toes and arms to rest on elbows just below the shoulder and not ahead or behind.Hips,shoulder,knees and ankles should be aligned and head should be with your spine which look like a raised plank.Maintain a normal breathing pattern and hold this position as long as you can atleast 30 seconds and over time,increase the timing to 2 minutes. 4. HOLLOW ROCK :- To do this lie on your back with legs in front and arms overhead,lift shoulders off the ground till the lower part of shoulder blade is on the ground.Feet should be off the ground by about 6-8 inches.Rock back and forth with your pelvis as the fulcrum,as many reps as you can maintain form. 5. RUSSIAN TWISTS :- To do this exercise sit on your sit bones with your torso angled at 45 degree angle,knees are bent and at a 45 degree angle from the hip.Using a med ball,bottled water or any weighted object,tap the ground close to your hip with it and lift ,tap the other side.Hips,legs and trunk should remain rigid throughout the movement.Inhale as you tap the ground and exhale as you lift.